Since I have it torn down this far already, I decided to go ahead and do a front split, so I could have a look at the flywheel and clutch. Having the engine loose also makes it much easier to remove the oil pan and replace main seals. Glad I did the split, but that is skipping ahead. First, I removed a bolt from each side of the belhousing, and installed my guide pins. 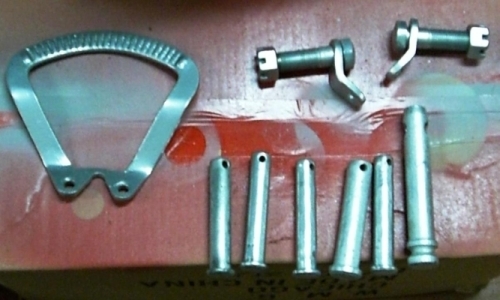 These are made from two 3" long bolts that have the same threads as the bolts just removed, the heads cut off, and ground to a rounded tip. You can see one in the photo to the right, and below the starter. These really help the two parts of the tractor slide apart without binding. They help even more when putting the two halves back together. Next I hammered wedge-shaped pieces of 2x4 between the front axle and axle support on either side of the engine. Guide Pins and wedges in place. This time the front half needs to be movable. 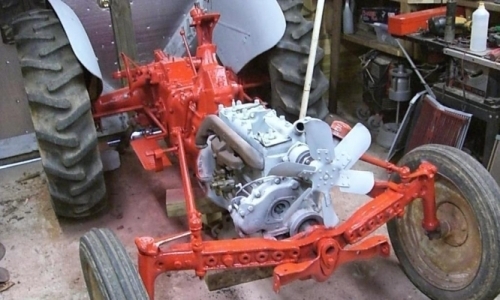 The transmission is supported on wood blocks adjusted to just barely take the weight off without lifting the transmission. 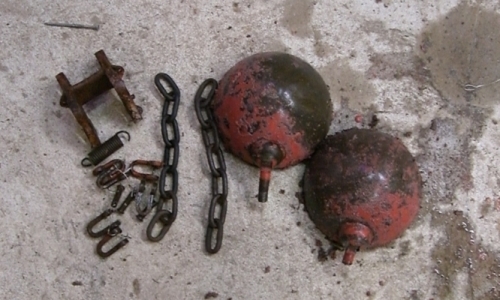 A small floor jack is used under the engine in these photos. With the guide pins in place remove all of the rest of the bellhousing bolts, and start wiggling the tractor apart. Keep an eye on the jack height. You may need to move each half up or down a hair to free things up, so they slide apart easy. 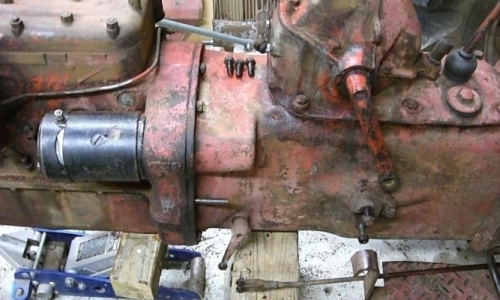 This is a photo of the overdrive transmission. This is not a Sherman Combo or Step-up, It is a very rare F&T Overdrive. Obviously, it installs different from the Sherman. I cannot see or feel the bolts that hold it to the front of the transmission. It looks like this one has to be dissassembled in place. Yep, after removing the Overdrive front cover and input shaft, there are the four bolts INSIDE the housing. The real bummer here is that in pulling the auxiliary transmission apart, needle bearings went everywhere. Even more fun, there are different sizes and no idea how many of each. A magnet was used to help find them all. They were cleaned them, sorted, inspected, and "glued" back into the bearing races with a little grease. Putting the roller bearings back together and reinstalling the overdrive "guts" gave me a chance to thoroughly inspect each part. 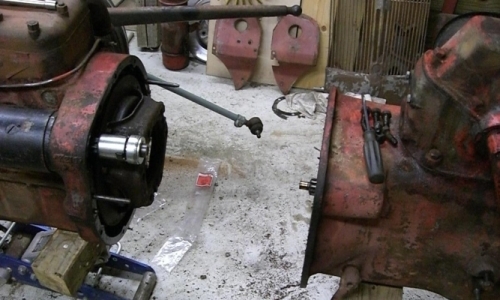 All of the internal parts of the auxiliary transmission appear to be in excellent condition. That's a relief! Scrounging parts for this rare F&T Overdrive would probably not be fun or cheap. The output shaft from the auxiliary seems loose. Hmmm, If I'm going to take a look at that all the guts will have to come out again. Then I can undo the tie wire on those bolts and see if there are some shims between the Overdrive housing and the transmission case. That is how you adjust preload on a Sherman, but I don't know if this one is done the same way. Also of concern is the amount of leakage in the front of this compartment. The oil appears to be coming from the engine rear main seal. The flywheel has a bad spot with missing teeth at least 6 inches long. That means the starter ring gear needs to be replaced and the pressure plate looks very rusty. I have a brand new starter ring gear hanging on the wall. Not sure if I have a decent clutch disc and pressure plate. Gotta go rummage in the used parts pile. PARTS! That reminded me, I had a bunch of parts cooking in the electrolysis tank. Here they are. Looks like the headlight buckets will need to be scraped and put back in for a while. This was my twisted idea of some quality Husband/Wife time. We got up Sunday morning and started cooking the new ring gear for my flywheel. The FO-4 manual says 350 degrees and has a caution about using too much heat that could change the temper on the teeth or warp the gear. Sharon was a little hesitant about having tractor parts in her oven (imagine that). But once she saw the nice brand new clean ring gear, she opened the oven and set it to preheat. I don't know what she did, it's one of those new electronic ovens. She whacked a few buttons and it went "BEEP". Look carefully at your new ring gear. 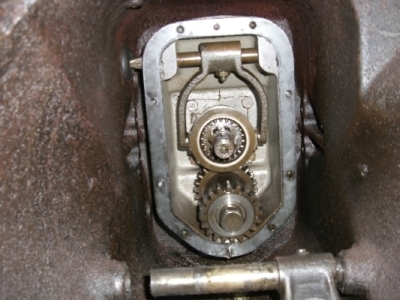 The teeth may be cut slightly different on one side to allow the starter drive gear to engage easily. If there is a difference, the tapered edge of the teeth go on the side away from the engine. 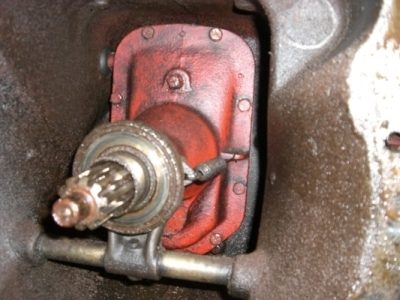 The starter drive engages from the clutch/transmission side of the flywheel. After preheat, we stuck the gear in the oven. How long does it take to "cook" a ring gear? Beats me, we decided after 15 minutes it must be "done". It didn't smell nearly as good as a batch of cookies. The flywheel was out on the deck, so it was COLD! I grabbed two potholders and quickly took the gear from the oven and dropped it on the flywheel right outside the kitchen door. CLANGGG! Nope, not even close. I couldn't tell that the ring gear had expanded at all. We tried it 3 times with higher oven temps, and longer cook times, with no success at all. The flywheel and ring gear are now hanging on the wall in disgrace. They are being punished. Maybe they will be ready to cooperate after hanging in disgrace for a few weeks. I think Sharon was more upset than I was. Time to crank up a computer, go on the NTractorClub N-board, and see what crucial step I missed. The votes are in, and all the experts agree, the FO-4 shop manual is wrong. We need about twice as much heat as we can possibly get out of a normal residential oven. This one was ONLY 14 inches. But a major storm for Virginia is 4 inches. The 52 has been running great. This snow was a very light powder, easy to move even with just air in the tires and no chains. 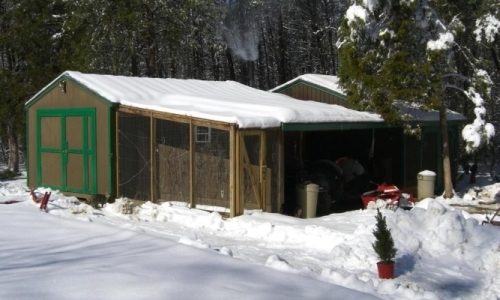 The shop has electric strip heaters and a wood stove for heat. It was certainly cold enough to have a fire in the wood stove on Sunday. It got nice and toasty in the shop, so I was able to paint some small parts. Looks like I am going with a "red belly" paint scheme on the 46-2N. I hadn't made that decision yet, but when it came time to start painting, just naturally grabbed the red color for these parts. The parts look very orange in this photo. They are not at all orange. The paint used is RustOleum - Sunrise Red. 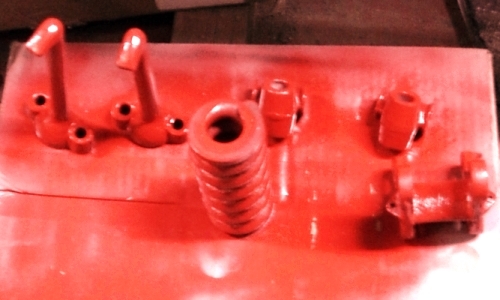 These parts are powder-coated. I attempted to duplicate a zinc-plated "new hardware" look by mixing several powder paint colors. OK, this is getting old. Only a week since the last one. Snow is piling up around here. This storm included ice, sleet, and lots of heavy-wet snow. We lost power several times, but not for much more than two hours. There were at least 14 trees down across the driveway Saturday morning. I had to cut those and clear the drive before I could plow snow. 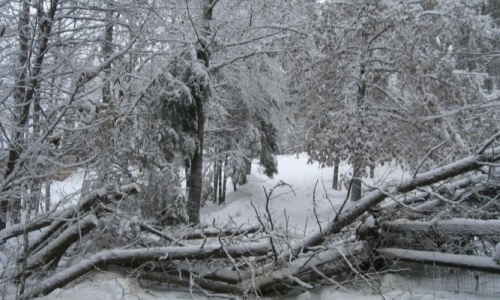 Trees and branches were still falling and snapping during the day Sunday. Thank the Lord none hit me, the house, or other buildings. 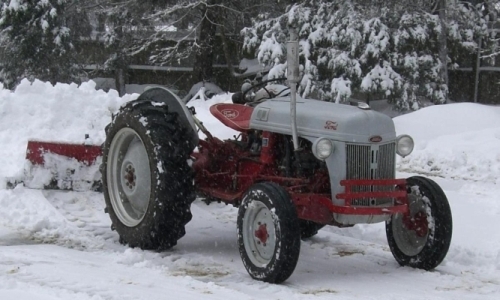 Plowing snow must be wearing the tractor out. The 52 coughed, sputtered and died right in the middle of the driveway. Obviously out of gas, except I know the tank is well over half full. Traced the problem to a clogged fuel valve assembly. Had to drain the fuel tank and change-out the fuel valve in the worst part of the snowstorm. Good thing I keep a few spare parts. 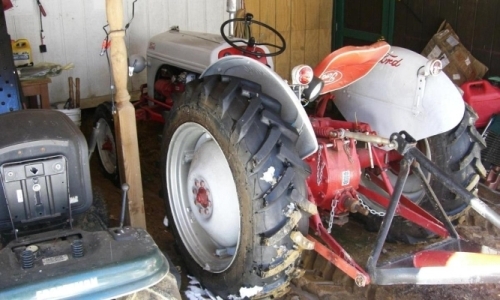 Got the tractor running again before the snow got too deep to plow. This is one knot of trees I had to cut up and move. 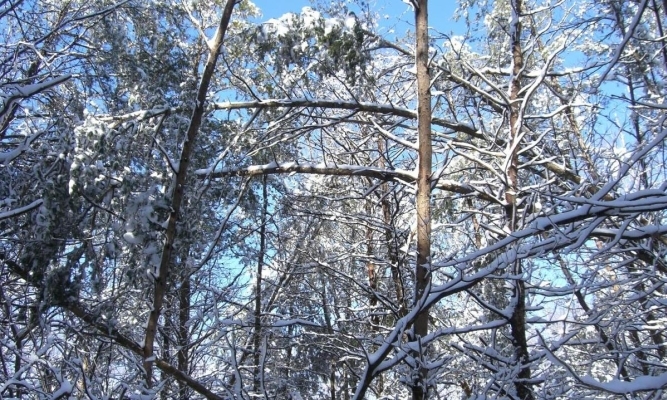 Here are some of the bent trees that were still coming down on Sunday. 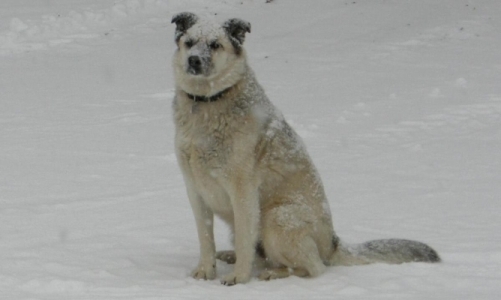 Dillon is part Husky (a small part, he's mostly mutt) but he likes snow (even when it sticks to his face). Finally got the 52 put away on Sunday, and already had a fire going in the shop wood stove. It had cooked down to red coals, so I decided to chuck that ring gear in there, and toss a few small pieces of firewood on top. Checked it and turned it around once (the coals were obviously hotter in the back). When I pulled the ring gear out it was glowing with just a hint of dull red most of the way around (probably 600-700 degrees). It easily dropped right on the flywheel. I had a cup of water handy to cool things down. The ring gear made a "screech" sound as it suddenly shrunk to fit the flywheel. Perfect! Put a DONE stamp on that job. Reinstalling the flywheel/clutch assembly is easy. Much more difficult was replacing the engine crankshaft oil seals, and oil pan gaskets. Good thing I put the engine on a stand and turned it over. The front main cap / oil punp housing was loose! Looks like someone used the wrong length bolt (too short), and it pulled the last two threads out of the block. This was a huge ticking time bomb. Having spare parts on-hand pays off again. I had some used main bearings from another engine, and matched-up replacements for the front bearing halves that had spun. Removed all the mains, looking for metal from the spun bearing. Saw nothing but a little fine stuff. Rinsed that out with fresh oil. Since I had the crank almost out, replacing main seals was easy. Used PlastiGauge ® to confirm proper bearing clearances, and bolted everything back together with the correct length bolts this time. Thankfully, there were still plenty of threads at the first main bearing. It didn't even need a thread repair kit. The rotating assembly in an engine is not complicated, but this is no place to cut corners. Rotate the crankshaft as each bolt is torqued-down in stages. If the crank suddenly get's harder to turn, stop, and figure out what the problem is. Now is when we want to discover the wrong size bearing, or something installed backwards. I treated this like a new assembly, and used plenty of assembly lube on all bearings. It might be some time before this engine is started, the assembly lube is thick enough to stay put until I'm ready to run it. The 2N is rolling again! It's back on the wheels, and able to be rolled around. The new steering works great!